As Star Wars: The Force Awakens cleaned up at the box office, researchers from Georgia Tech took a closer look at the science of the films. They answered five big questions about the worlds depicted in the movies and what’s possible in reality. We’re revisiting their responses to celebrate the release of the 2018 installment in the series, Solo: A Star Wars Story. 1. Is light speed even possible? Han Solo isn’t a bashful hero. So it’s no surprise that it took him only a few moments after we first met him to brag that his Millennium Falcon was the “fastest ship in the galaxy.” But how fast is fast? Solo said his ship can go .5 past light speed. 2. Could these new worlds exist in our universe? “Until 1991, the only planets known to humans were in our Solar System. In that same year, astronomers discovered the first extrasolar planet, now dubbed as exoplanets, by measuring the Doppler shift of stellar spectral lines, effectively witnessing the planet play gravitational tug-of-war with its parent star as it orbits. Over the next decade or so, astronomers refined their planet hunting skills and found more than 30 exoplanets. “This all changed with the launch of NASA’s Kepler Mission, which continually monitored a patch of sky for brightness variations in 150,000 stars. Any dip in brightness can be caused by a planet passing in front of its star, blocking a small fraction of its light. In its four-year run, Kepler detected and confirmed nearly 2,000 planetary systems, ranging from “Hot Jupiters” to frozen, rocky worlds. Intriguingly, a select few lie within the Goldilocks zone where liquid water could exist because the planet isn’t too hot or too cold. “This planetary diversity is also seen in Star Wars—Endor, the home of the Ewoks, that orbits a gaseous giant planet; Hoth, where Luke Skywalker almost froze to death; Alderaan, a blue-green orb not unlike our Earth until it was destroyed by the Death Star; and Tatooine, Luke and Anakin Skywalker’s home planet. One of the most vivid scenes of Episode IV happens when Luke gazes toward the horizon at a binary sunset. When the original was released in 1977, such a scene was restricted to the sci-fi realm, but this is no longer the case. Kepler has now discovered 10 planets that orbit binary star systems, whose possible inhabitants see a similar sight every day. 3. Are C-3PO and R2-D2 coming soon? “Robots tend to be on one extreme or the other these days. One kind is found on Mars, battlefields, and in operating rooms. These robots are extensions of humans—they’re rarely autonomous because a human is always in the loop. “Others are autonomous. We see this mostly on manufacturing floors, where machines are programmed to do the same repetitive task with extreme precision. Not only are they limited by what they can do, but they’re also often separated from people for safety reasons. “I’m focused on something in the middle. Full autonomy for personal robots would be great, but it’s not yet practical given today’s technology. Humans are too unpredictable and environments are ever changing. Rather than setting 100 percent autonomy as the goal for getting robots into our lives, we should deploy them when they’re simply “good enough.” Once they’re with us, they can learn the rest. “Here’s an example: in hospitals, a delivery robot could pass out towels and medication. If it were to get stuck leaving a room, the machine could call a command center where a human technician would figure out the problem and free the robot. Here’s the key: every time a person made a fix, the robot would keep that new information and use it to perform differently the next time it leaves the room. With humans in the mix, this robot could learn from its mistakes and continually push toward 100 percent autonomy. 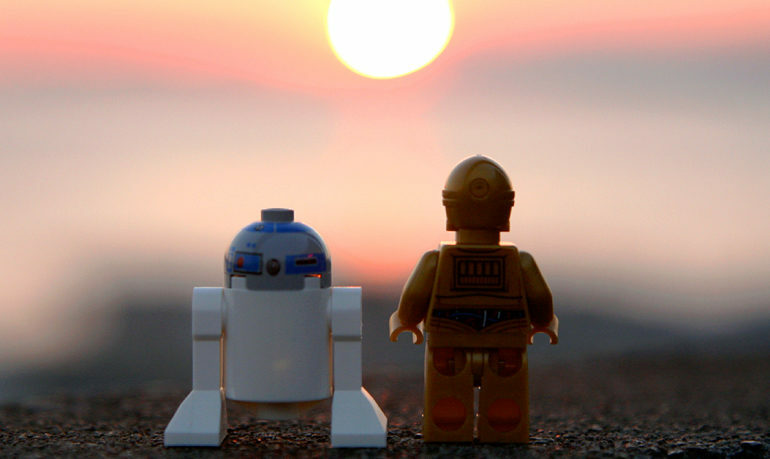 “As for R2-D2 and his friends, we’re not that far from personal robots. I don’t think we’ll have to clean our houses in 20 years because we’ll have robot helpers. I’m not sure what they’ll cost or if people will psychologically be ready to give up that part of their lives, but we’ll have the software and hardware in place to make it happen. 4. What would it be like to master the Force? “Didn’t we learn from physics classes about Newton’s third law? For every action, there is an equal and opposite reaction. If true, it would mean that when Yoda exerts a force on the X-wing, Luke Skywalker’s spaceship should also exert the same amount of force on Yoda. So why doesn’t the little fella get squished like a mosquito? 5. Can the Force be a new interaction that we haven’t discovered yet? “The death of the entire planet sent shock waves through the Force, weakening those who were able to feel them. That included Obi-Wan, who briefly became faint. This action at a distance is explained in physics by what is called a field. For example, we are well aware of gravitational and electromagnetic fields. Objects that are affected by a field carry “something” that allows them to interact. For gravity, it is mass. For electricity, it is charge. “Because there is a Light and a Dark Side of the Force, a field would require that we assume two types of charges, similar to positive and negative charges in the electromagnetic force. Here’s an example: Darth Vader can strangle people by using the Force without physical contact. That means his victims would have to carry both types of charges in equal amounts, and the effects of the two types cancel each other. How does it happen? “One explanation is that the dark force Vader unleashes attracts the light charge of his victim, leaving the person unbalanced with an excess of dark charge. In this case, all the dark charges then try to come together along the neck, squeezing and nearly choking the person to death. This means that unlike electric charge, particles with equal force charges attract and repel when they have different charges. This could explain why a neutral force charge is common to all objects. It could also explain why the Dark Side has an addictive aspect: when a Jedi turns to the Dark Side, it’s a slippery slope filled with continuous evil.